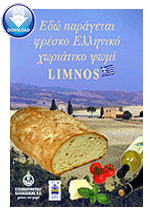 Chalkidiki Flour Mills provides high quality products due to its highly organised quality control facilities and educated staff. Strict quality control of our products is guaranteed by chemists, agronomists and food technologists, who staff our company and have excellent academic qualifications. All our products are tested in our laboratory under conditions effective Baker to refine them. Thus, 100 different types of flour and blends are characterized by producing the highest quality standards, overcrowding standards of food and beverage G.CH.K. (Articles 34, 104 & 106), while the paper is suitable for packaging food in accordance with the Directive EEC 89/109. This high and consistent quality and a wide variety of products, coupled with direct customer service make us one of the leading companies of its kind. Employees in research and development, marketing and sales training is constantly on our own premises, with seminars. Thus, it is able to find time to customer needs and company to design products that meet these needs. In addition team of collaborators creates products, measures the customer in accordance with the requirements and the recipe. At Chalkidiki Flour Mills we believe Quality Control is an ongoing process. Employees in every department area are responsible for continual inspection and maintenance to ensure that our facility, operational procedures related to product quality, hygiene and sanitation meet or exceed industry standards. We embrace new ideas, working together and setting higher standards. The quality of our products is ensured because of the finest ingredients we use, the way they are handled in accordance with our in-house quality systems, and finally, our state-of-the-art equipment. We test bake products from every batch produced. The result is perfect products time after time.